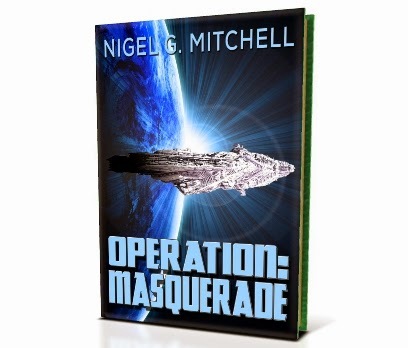 Nigel G. Mitchell - Author, Blogger, Geek: You Can Win a Free Copy of "Operation: Masquerade"
You Can Win a Free Copy of "Operation: Masquerade"
I'm hosting a giveaway of my latest novel, Operation: Masquerade! When Jason Locke retired from the super-secret agency known as GAIA, he thought he could settle down and live a normal life. Then his old boss convinces him to return for one last mission that could end the war between the Terran League and the alien Chitt'k. But the mission involves trying to pass himself off as a Chitt'k and live among them to steal their most guarded possession: a living computer. Even as Locke risks it all to carry out his most dangerous mission yet, he's unaware that a conspiracy is working against him. OPERATION: MASQUERADE is a fast-paced action adventure that will carry you from the slums of a future Earth to a battle among the stars. The prize will be one of five digital copies of my sci-fi adventure novel, Operation: Masquerade. If you win, and have a Kindle or the Kindle app, I can email a copy to your Kindle account. If you don't have or want to use Kindle, I can also email you a copy in PDF format. Sign up in Rafflecopter above. You can just enter your info, but also get bonus points by tweeting a message about the book, and following me on Facebook or Twitter. Be sure to let me know in the comments if you do. The five entrants with the highest points win. The contest ends next Saturday, May 24. If you already have the book and want to help a brother out, you can tweet about the contest or promote it on your Facebook or blog. Just something like: You could win a free copy of "Operation: Masquerade" by Nigel G. Mitchell! Go to http://nigelgmitchell.blogspot.com/2014/05/you-can-win-free-copy-of-operation.html for more details."